You are here: Home > News > Chapter News > Event > The Giving Challenge – Sept 20 & 21 * Noon to Noon – Be The One!! This year, donations made to HLAA-S/M through the Giving Challenge website from Noon to Noon, September 20 – 21 may be doubled – or even TRIPLED – thanks to the generous support of The Patterson Foundation. That means, if you donated to HLAA-S/M during the 2015 Giving Challenge, your 2016 gift of $25 – $100 will matched 1:1. If you didn’t donate to us during the 2015 Giving Challenge, your gift of $25 – $100 will be matched 2:1. How else can your triple your investment with the click of a button? That’s a challenge we can all meet. Will you BE THE ONE to Help Inspire, Educate, and Empower those with hearing loss? 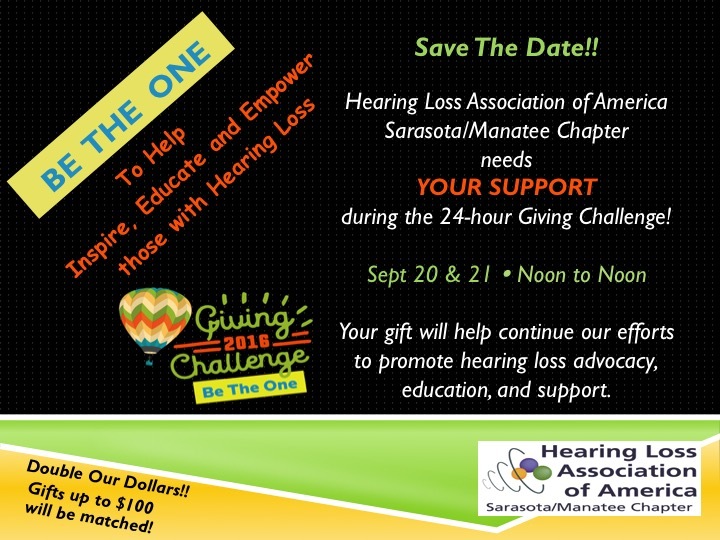 BE THE ONE to spread the word to make hearing loss visible in SRQ! Share our Giving Challenge Facbook event with your family and friends! The 2016 Giving Challenge is presented by the Community Foundation of Sarasota County with giving strengthened by The Patterson Foundation, as well as support from Manatee Community Foundation, John S. and James L. Knight Foundation, William G. and Marie Selby Foundation, and the Herald-Tribune Media Group. Many thanks to these sponsors for their generous support! !